I wrote in more detail about GW23 in my early FFGeek team article if you want more info but here I’m going to be brief. It ended up a pretty good week when I was prepared for a red arrow at the least. A 41k green arrow to 101k OR. What was most pleasing was I got my own back against the template after it really cost me last week. My differentials did ok too. So while I will go into more detail on my double and blank thoughts below in simple terms I’m going to carry over my free transfer to have more flexibility to plan for the double in GW25. I feel Pogba and Aubameyang could really hurt me but I’m going just to take the pain this week. So no transfer. Carrying over a free. So here’s the team planner. You’ll notice it has grown a couple of arms and legs which I’ll explain. So in this section I’m only concentrating on prospects for this week. 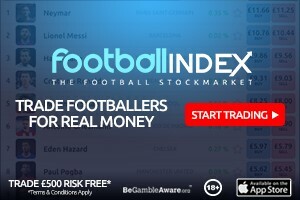 Rashford, Kolasinac and Salah are under 2.00. But Wan Bissaka is £3.50 for a clean sheet and if Lovren doesn’t start then Barnes will come on at £4.00 to score. So not ideal. Btw the GK odds don’t fuss me as save points tends to mitigate clean sheet odds. My 2 template battles are Sane v Pogba and Koalsinac v Digne both of which I feel reasonably well placed. I could do with Lovren starting otherwise the Liverpool template defence gets a freebie against me. Of my differentials Barnes and Morgan are on the bench. Ings and Hazard have good fixtures though and I’m hopeful for returns from both. Foster not so much although the prospects will grow if Son isn’t fit. Unfortunately it’s that time of the season. Once upon a time it was an easy way to make a big OR increase but now there’s so much information that it doesn’t really change the dynamic of the season apart from maybe making it a bit more of a lottery. At the moment I’m sticking with my chip plan but I hope to run some simulations of what could happen to see if that changes anything. There was a possibility that Chelsea could get to the FA Cup semi’s and a 3rd double gameweek would be needed but with them drawing Manchester United in the 5th round that carries alot of risk now. I would probably put more money on the weather creating postponements than Chelsea. Or it’s go with Salah in GW36 v Huddersfield. So for me I’m looking at the triple captain in DGW25 even though there is no worse double gameweek than one with Man City and their opponent as the only beneficiaries. Who knows who could play 2 games consecutively for Man City let alone 2 games days apart. For me the focus is on Aguero and Sterling who at least are strong off the bench. Sane I fear may not play twice if Mendy is fit. The whole TC situation is far from ideal. 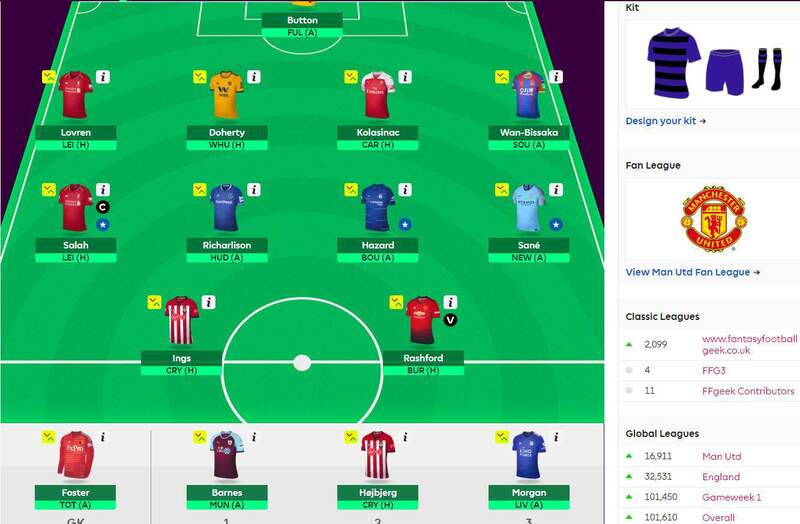 Given the above then the plan is to get a team of players with games in blank GW31 that also play in blank 33. Who has doubles in 32 and 35 is fairly irrelevant as I will wildcard and free hit them. The simple answer now is 3. The team planner theorises another 5 to take me to 8. As yet I haven’t done a transfer planner to see how it would work out. Joseph Crilley though has this natty google spreadsheet which can help you plan your transfers. After the FA Cup 5th round draw I updated the schedules which show how these gameweeks are progressing. The teams with fixtures in both GW31 and GW33 are still as follows with some player suggestions. The 5th round FA Cup ties could still change things though. No real issues this week. I chose Button over Foster although I would be surprised if the returned Ryan doesn’t start. I chose Wan Bissaka over Barnes and Hojberg even though it conflicts with Ings. See also the teams of 10 top FPL managers who have finished in the top 10k for the last 3 seasons. Hi geek, Is it better to take in Auba/aguero in a direct swap for Kane or bring in a premium mid. Like jimenez and sterling for a – 4…. I do have 3.4 ITB – saving for the inevitable Haz-> Salah transfer. But I could do firmino -> Auba this week. Be a challenge to get Salah but is it worth it? Geek – I would bet a mortgage payment you choose Aguero over Sterling (or any other mid from city), barring injury as it will be an easy swap to Auba in 26 or 27 for the GW27 Auba armband. My question is why not do it now for the Newcastle game? I get you want flexibility but he has 14 goals in 12 games against them. Good luck – my head hurts from all this planning. Man City and the rotation anxiety is not ideal for a double gameweek when I have young kids and a career I need to focus on..
NS – I would suggest Aguero over Sterling and a -4. For same GW27 Auba reason above. Good luck. Ive seen quite a few on twitter who are TC’ing Auba in this gameweek. Because of the unpredictability of the Man city DGW25. And then no real other opportunity to use it. Geek – how is that you have yet to bring in Jemenez to your team at all this season? hes serious value for money. Jimenez has been in my team a long time… great value he has shown again tonight. And my Auba double figure haul prediction came in too. I am still baffled how he was in the top 5 transfers out this GW!! Hi geek, I see you want to use TC in gw25 in both of your options. I woudln’t use it in this gw any way, I guess you want to use it on Kun, I really think that he will paly only 1 game and it can be Arsenal, but that is only my thought, in my option you can use TC in gw35, for example if Chelsea are through to the semi they can have Westham and Burnely at home, City will have Cardiff and Spurs both at home, united (the 3rd top6 that in the cup) will have 2 away games vs wolves and everton, but I still think it’s a better time, and City for exmaple is closer to the semi after the draw of the 1/16. I am following the same route as you Yaniv. I read some people putting forward the objection that you are using the WC for setting up your bench boost 2GW’s later and in between there is an International break, and you could therefore suffer injuries. Well my retort would be: how many injuries can one expect to have in their squad after an Int break? 1 or 2?… well the FT will sort 1 injury and a -4 will sort 2. It’s not a big deal really. In my scenario 10 teams would have doubles in 32 and then 5 would have blanks in 33 so if you matched those teams you could put a decent team together for blank 33. When you transition to 35 none of those 5 teams will have a double 35 by my calculation and only 4 teams will have doubles in both 32 and 35 none of which are the 5 blankers in 33. 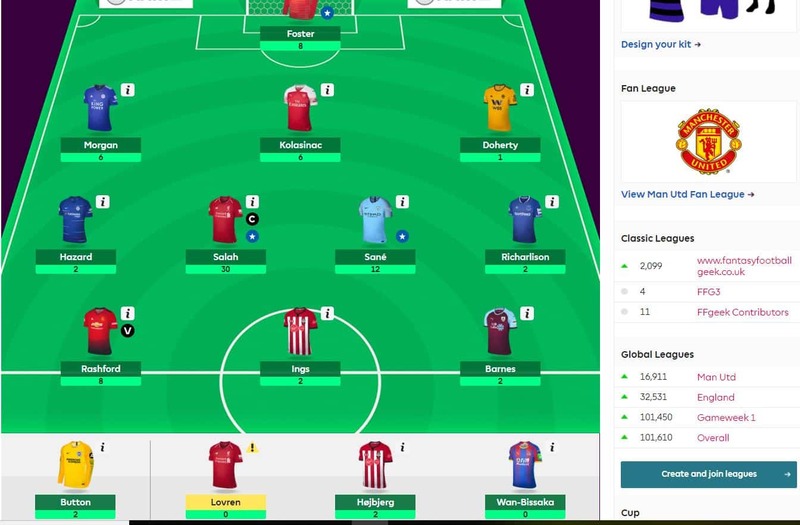 Obviously you would have at least 4 bench players from 33 with a double in 35 plus 2 transfers which would give you 6 double gameweek 35 players. One other thing is that the gap between 31 and 32 is 2 weeks so I don’t think the postponements will be announced until after 31 so the TV companies can maximise their revenue with the best fixtures in the best place. Therefore I don’t think at 30 you will be able to pick which fixtures will be postponed to 32 and which will be postponed to 35. You wont know who the semi finalists will be so your wildcard set up to maximise 32 would involve a few assumptions. It depends on whether those factors outweigh having to prepare in advance a team for blank GW31 where in my view most people, including myself, will need some luck in the 5th round to get a team of 11 out due to the interruption of dgw25 and blank 27 as an interim focus.